Gov. Mark Dayton has proclaimed the week of May 19 - 25, 2013, "Public Works Week." Download State of Minnesota Proclamation (pdf). APWA has selected “Because of Public Works...” as its theme for 2013’s National Public Works Week. The theme is about the quality of life brought to communities around the world. We are able to have clean water, safe streets and neighborhoods, efficient traffic and safe clean communities "Because of Public Works..."
The City of Richfield created the video below to celebrate 2013 Public Works Week and educate residents about the importance of public works in their everyday lives. APWA encourages public works agencies and professionals to take the opportunity to make their stories known in their communities. Over the years the observances have taken many forms, including parades, displays of public works equipment, high school essay contests, open houses, programs for civic organizations and media events. 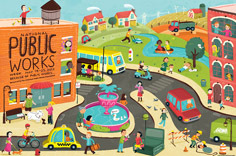 Learn more about National Public Works Week 2013.